Because I found myself rambling on and on about the first page, I decided to compartmentalize the instruction to make it easier to absorb. And since I played the “Tempest” years ago, the surest route to my restoring the piece to a respectable performance level, was to practice it from the ground up in slow tempo. 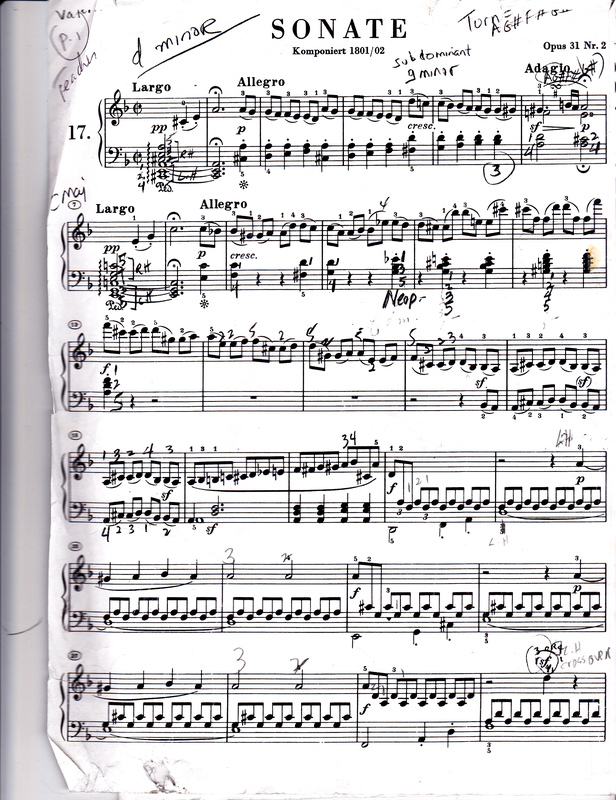 As I re-approached this Sonata, I relied heavily on CLUMPING or CLUSTERING groups of notes. In the video, I demonstrate a wrist forward motion as I clump the seconds which embody non-harmonic upper neighbor tones that are passing dissonances. Clumping these 2nds (appoggiaturas) and throwing the wrist forward for each group of two allows a bigger and more effective energy to mobilize the passage. It also helps with developing a “feel” for the composer’s keyboard landscape before advancing tempo. Next postIn the Piano Universe: Two You Tube Treasures not to miss! Nice tips, although slow practice should be more than sufficient. It can be tedious and time-consuming to alter rhythms and block arpeggios unnecessarily. Practising by trying to achieve the desired result is usually more effective than doing something else arbitrarily, unless you are trying to overcome a specific difficulty. I find this approach unnecessarily mechanical. My approach to music is not mechanical. In this instance for many viewers who tend to be fingers down players struggling with issues related to fatigue in executing redundant figures such as present in the Tempest, (opener in this case.. pairs of 8ths, in rapid sequence, with a built- in agitato) insights about wrist forward applications might help them. In my own private teaching practice I’ve observed that clustering, blocking etc with a pertinent wrist forward spring really has improved technique. (where applicable) And when I observed Rudolf Serkin “blocking” the opener to Beethoven’s Emperor in a rehearsal that I was privileged to watch, (decades back) it suggested possibilities I had not entertained at that time. Blocking in the harmonic context..knowing the functional landmarks of course is also a great framing as one goes along. Trying to cover tons more than I did, would have been an hour-long part one. I will be continuing to examine the Tempest in sequential blogs. I think the problem is that you did not clearly set out what you were trying to achieve. Technique cannot be functionally appreciated without a clear conception of its purpose, which ultimately is the consequent sound produced. You did not explicitly relate the techniques you demonstrated to the results which they facilitate. I think for some viewers, the effect was opposite to yours as I am getting contrasting feedback. Just the same, your opinion is valid through your lens, your ears, etc. My point was to help students realize a complex musical landscape applying my insights about clustering, blocking and having a flexible or supple wrist. I have integrated the approach as well into less advanced music such as Burgmullers Op. 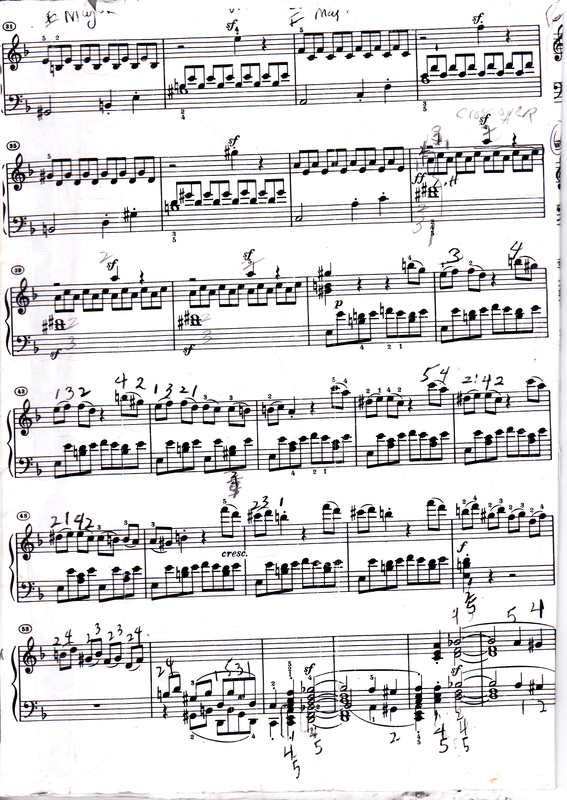 100, 25 Progressive Pieces, Inquietude and Tender Flower. In the former, three note wrist forward initiated groups, and in the latter, pairs of legato notes.. that actually end with a staccato.. but not taken literally in the Romantic genre. I believe what I set out to do in the opener of Tempest was achieved on the basic level I intended. Wanted to say I like the idea of practicing clusters, and I will try it with this piece. I really struggled with those descending eighth note passages at the beginning. RE the “wrist forward” motion: I am not seeing it when you play up to tempo. Is this a practice tool or something that simply becomes smaller at faster tempos? Hi, Harriet, Thanks for your feedback. The overt or conspicuously executed wrist forward motion becomes sized down, or attenuated in fast tempo..(The wrist flexibility is most crucial) I try to over-display it in practice mode, as I did when demonstrating Inquietude from Burgmuller’s Op. 100. (groups of three notes slurred in fast tempo in another video instruction) It’s more obviously noted in a slow tempo with pairs of 8ths as in Tender Flower, same Op. 100. If you start with a more fluid wrist with flexibility that will energize the fingers as I demonstrated. On a positive rather than critical note, it’s great that you’re sharing your knowledge and experience through these wee tutorials. Many thanks. Thanks again. Your sharing is valuable and welcomed.